The ADT Corporation, the largest security company in the United States and Canada, announced Wednesday that it will pull its ads from CNN in the wake of the growing drama surrounding a photograph showing Kathy Griffin lifting up a bloodied decapitated head meant to resemble President Donald Trump. Griffin has co-hosted a live New Year’s Eve broadcast on CNN since 2007 alongside network anchor Anderson Cooper. The network said late Tuesday that it was “evaluating” its relationship with the 56-year-old comedian. Cooper denounced Griffin’s photo in a short statement on Twitter. “For the record, I am appalled by the photo shoot Kathy Griffin took part in. It is clearly disgusting and completely inappropriate,” the AC360 host wrote. ADT’s announcement comes as the Route 66 Hotel and Casino in Albuquerque, NM has canceled Griffin’s scheduled performance. “The performance by Kathy Griffin on July 22nd has been cancelled,” the casino wrote in a message posted to Facebook. A full refund to any guests who purchased a ticket was also promised. Griffin’s social media accounts were flooded with calls from social media users urging others to boycott her upcoming cross-country comedy tour dates and venues to deny her a platform to perform. President Trump tweeted Wednesday morning that Griffin’s photo had been difficult for his children, including his 11-year-old son, Barron. 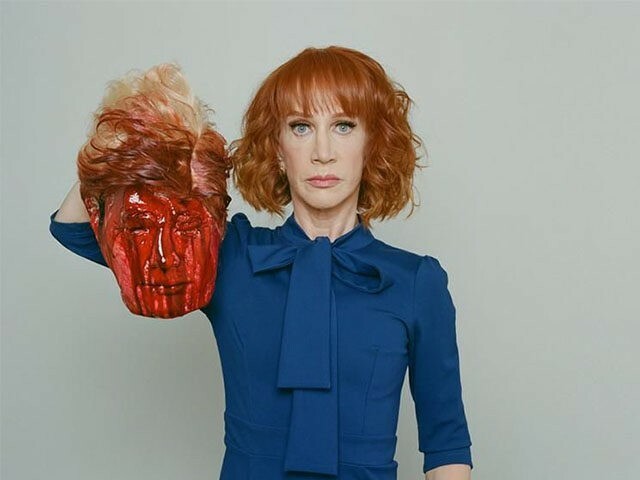 While Griffin has issued an apology, admitting that the photo “went too far,” she has yet to apologize directly to the president and his family. The U.S. Secret Service, however, is reportedly investigating the “circumstances” surrounding the photo shoot.